Sunday was St. Patrick’s Day, and around here that means corned beef and colcannon. Daughter Miriam is off onions and garlic—although she has recently been OK with just a little green onion. For this meal, I made my regular colcannon for the rest of us and a smaller one adapted for my daughter. We are having a “festival dinner” for one of Jan’s students who is Chinese. In China, to show respect for your guest you offer many dishes. Including the gravy, I served ten dishes for this meal. I am making Jan’s birthday meal of chicken mole, beans, and rice. That is a lot of meat and starch, but Jan also likes to be vegetable forward. My original idea was for a mango and avocado salad, but for seven people that would either be very small serving for each person or very expensive. 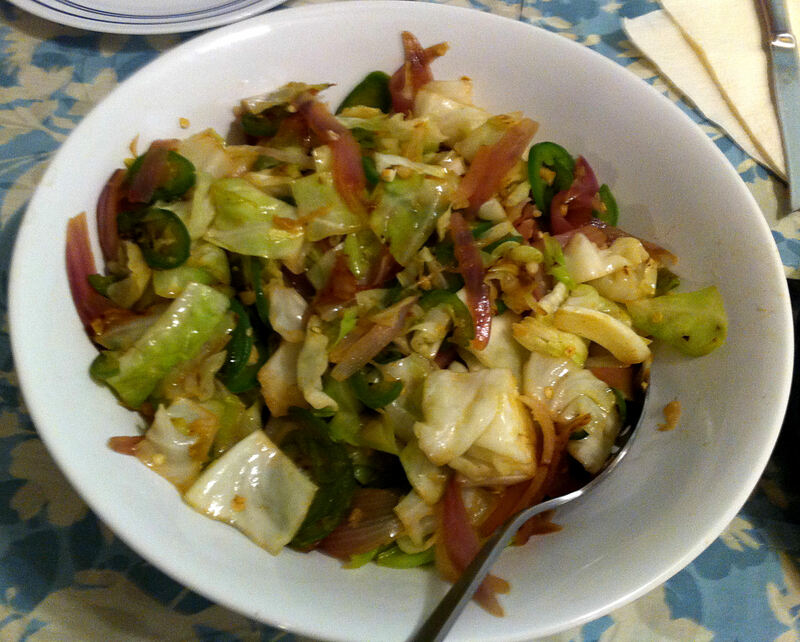 I am making several vegetable dishes for my Japanese feast this Sunday, pickled cabbage is an easy choice for me. Japan has many Tsukemono, literally “pickled things.” When my father came back from Japan in the fifties, he introduced my family to Japanese cuisine. One dish that he learned to make was salt pickled cabbage (kyabetsu shio-zuke; キャベツ塩-漬け ). A fond memory of my childhood was this salty crunchy pickle, that he only made occasionally for special occasions. I had originally planned on a simple coleslaw with a vinegar based dressing for this Sunday’s dinner. However, the Stone Soup drive made me start adding ingredients—maybe some red cabbage and radishes, maybe some marmalade and ginger. This was a salad to go with my ham steak. Japan has many tsukemono, literally “pickled things.” When my father came back from Japan in the Fifties, he introduced my family to Japanese cuisine. One dish that he learned to make was salt pickled cabbage (kyabetsu shio-zuke; キャベツ塩-漬け ). This is more of a California Fusion revamp of the original, rather than a traditional colcannon. Potatoes are the staple of the traditional Irish diet and colcannon was, most likely, mostly potatoes with a little bit of vegetable added in—usually cabbage. Jan is always pushing me to add more high fiber vegetables and to cut back on the simple starches—i.e. potatoes—so mine is now about a 50/50 ratio of potato to veg. I also doubt that chicken broth or garlic were readily available in a humble traditional Irish cottage. 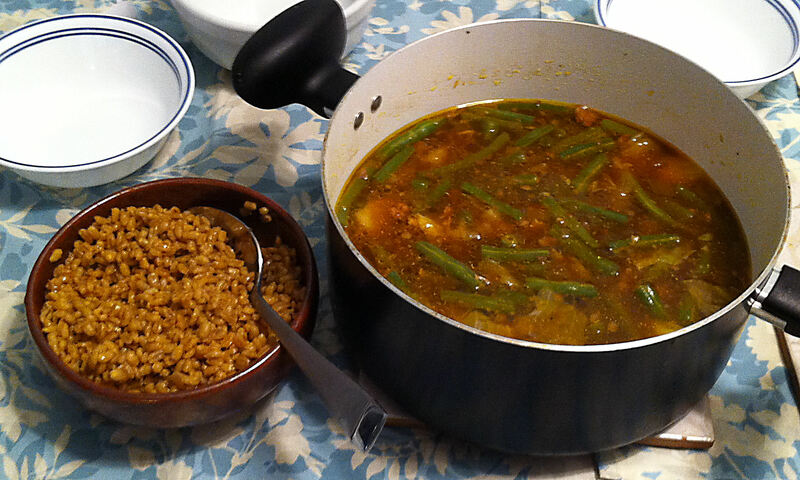 With Jan out of town, I made a lamb stew for Sunday night’s dinner. I also made this lamb soup. Son-in-law, Chris, asked why I did not simply throw everything into one pot. In my mind I had an image of the thick, rich lamb stew and a second vegetable soup with lamb bone broth. While it may all end up in the same place, it would not be the same dining experience to mix the two dishes. One of our favorite dishes from a local Chinese restaurant is Salt and Pepper Chicken Wings. I am sure right now you have a picture of heavily salted wings covered in black pepper in your mind. You would be wrong, the peppers in this dish are Jalapeños.